... where Gallic troops, many of whom had escaped from Julius Caesar and his legions at the siege of Alesia, fought the last battle for the independence of Gaul. 16th century depiction of the battle of Uxellodunum (Etching from the edition of Caesar de Johannes Jucundus Veronensis, 1547). A. Uxellodunum. B. Spring. C. Flaming barrels. D. Embankment. E. Wooden rampart. G. Tower. The surrender of Alesia in 52 BC led to the submission of almost all the peoples of Gaul. Their chief, Vercingetorix, was taken prisoner but Gaul's power was not entirely reduced. The vanquished Gauls re-established themselves very quickly and decided from then on to mount guerilla attacks against the Romans in small groups and at several points simultaneously. 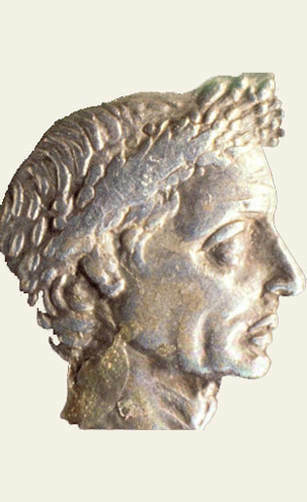 Caesar had to battle successively with the Biturges (from Berry), the Carnutes (from Orléans), the Bellovaques (from Beauvais), the Trévires (from Belgium) and, finally, the Pictons, who were massacred in the region of Lemonum (Poitiers) where over 12,000 Gauls were killed. Book 8 of The Gallic Wars, added subsequently to Caesar's Books 1 - 7 by Aulus Hirtius, is the account of the civil wars. It relates events up to 50 BC. Following this rout Drappes, of Senon, at the head of a troop of 2000 to 5000 unsworn men, was joined by the Cadurcian Lucterios, an escapee from Alesia. They decided to invade Provincia (the region of Narbonne). The legate Caninius pursued them with two legions. When the Romans were about to overtake them, the Gauls took refuge on the oppidum (hill fort) of Uxellodunum in the land of the Cadurques (later known as Quercy). On reaching Uxellodunum, Caninius established three camps on high ground nearby and undertook the construction of a ditch (contrevallation) to circle the oppidum. Drappes and Lucterios established their camp ten miles from Uxellodunum. In this way they could harass the Romans and comb the region for supplies of wheat for their troops. One night, after gathering sufficient provisions, Lucterios was leading a convoy of wheat when he was intercepted by Caninius and was forced to flee. Using information extracted from the captured Gauls, the Romans then made a surpise attack on Drappes' camp, massacred his army and took him prisoner. The most surprising aspect of this story is that, despite having lost their principal leaders, the Gauls continued the fierce battle. They held their own against Caninius and against Fabius who had arrived with reinforcements of two and a half legions. Caninius was obliged to give an explanation to Caesar, who had arrived unexpectedly with his cavalry, followed by the two legions of Calenus. Seeing that the Roman fortifications completely encircled the place, Caesar decided to deprive the Gauls of water. 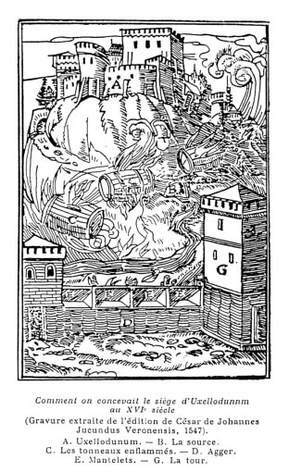 Their access to the river was made impossible by the machines of war and, just downstream from the water source, which bubbled from the foot of the ramparts, Caesar ordered to be built an 18m high embankment topped with a tower of 10 levels (27 metres high), constructed to prevent the Gauls getting fresh water supplies. These works were a lure, a diversion, because Caesar had another plan: to dig tunnels out of view of the defenders to dry up the springs. Despite violent battles and the burning of the tower, the Roman sappers achieved their goal. The Gauls, deprived of water, believed themselves abandoned by their gods and capitulated. Caesar was pitiless. The hands of all those who had carried weapons were cut off, but their lives were spared. This unusual cruelty was meant as an example to others, to prevent any further insurrection. The impending date of 1st March, 50 BC marked the end of Caesar's time as a proconsul and he wanted to return victoriously to Rome. A "horde of brigands" had almost put the rest of his political career in peril. The combat in 51 BC lasted around two months, from mid July to mid September. This brought an end to the Gauls' resistance to the Romans and Gaul became a Roman province, provisionally attached to the Transalpine province. Gaul was governed by Decimus Brutus, Aulus Hirtius and Munatius Plancus. Puy d'Issolud, a major site in national history, was officially recognised as being Uxellodunum on 26 April 2001 by the Minister of Culture. at a press conference held by Michel Vaginay (Conservateur au Service Régional de l'Archéologie in Toulouse) and Christian Goudineau (professor of the College of France).